This set of Biochemistry online test focuses on “ATP Synthesis – 2”. Explanation: Peter D. Mitchell was the one to propose chemiosmotic hypothesis. Explanation: ATP synthase synthesizes ATP by chemiosmosis. Explanation: The measure of potential energy stored as combination of proton and voltage gradients across membrane is termed as proton motive force. Explanation: The intermediate acyl cartinine is formed in the transport of acyl co-A for oxidation using a shuttle. Explanation: The conformational differences among β subunits extend to differences in their ATP/ADP-binding sites. Explanation: The acyl co-A formed in the cytosol is transported to mitochondrial matrix. Explanation: Every cycle of β-oxidation produces 1 FADH2, 1 NADH and 1 acetyl co-A. Explanation: Membrane potential and proton gradient are both required to make ATP. Explanation: Long-chain fatty acids are oxidized step-wise in one carbon units starting from carboxyl end. Explanation: Fat yields maximum energy per gram on oxidation. 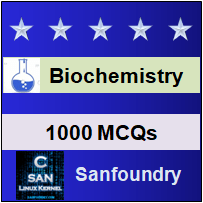 To practice all areas of Biochemistry for online tests, here is complete set of 1000+ Multiple Choice Questions and Answers.